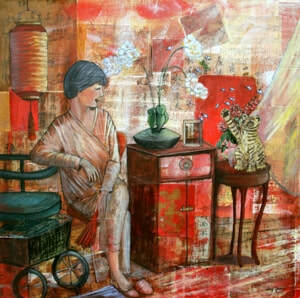 This painting is about my mom, Mei. I love my mom and I know the feeling is mutual. My mom is not the nurturing type nor is she particularly affectionate, perhaps it has a lot to do with our culture. Mei is definitely an unconventional woman, she is filled with wisdom and stories. At the age of 7, I was sent abroad for education while my parents lived and worked in Malaysia. My childhood was very different, in the very short time that my mom and I spent together, the one lesson that I remember and treasure the most is that she taught me to be independent. One thing that my mother was and remains today is that she is a feminist. She taught me to be self reliant and that when I grow up, I have to be financially self sufficient and never count on anyone to be my provider. That lesson was truly a gem not just for me but as it should be for all the girls and women all over the world.